Of all the afflictions in this world, the suffering of the parents of a disabled child is major. Why? some sufferings will last for some days, if not, some years. Time perhaps has the power to cure it. But the suffering of the parents, having a disabled child, will be till their last breath. Knowing pretty well that their disability will be till the end of their lives, the parents will struggle to find solution for their handicaps of their god-gifted children. In their effort, they don't get detered. The fond hope that one day they reach near normal stage will move them forward. They face many odds. Yet they strive on. Many a parent has sacrificed their lives to bring those children up. It is from their persistent effort and sacrifice LAHARI emerged. Logo Mean : The loathsome caterpillar will change into a very beautiful butterfly one day. How exquisitely it looks! What delight it gives! 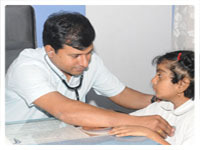 LAHARI 'S VISION : Similarly, the disabled children can be trained independent. 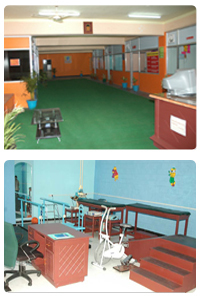 For this, the child is to be trained at a place where all kinds of therapies are available under one roof. If the parents find such a place, their burden in rearing up the children will be much lessened. In a way it is paving way for their bright future of their children. The moment the parents realize the disability of their children and the training to be given, they should not hesitate or delay in joining them in special schools. 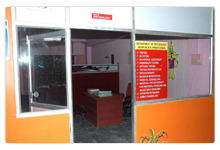 The parents at once should consult the qualified professionals and get the required help. It is here LAHARI will be greatly helpful.